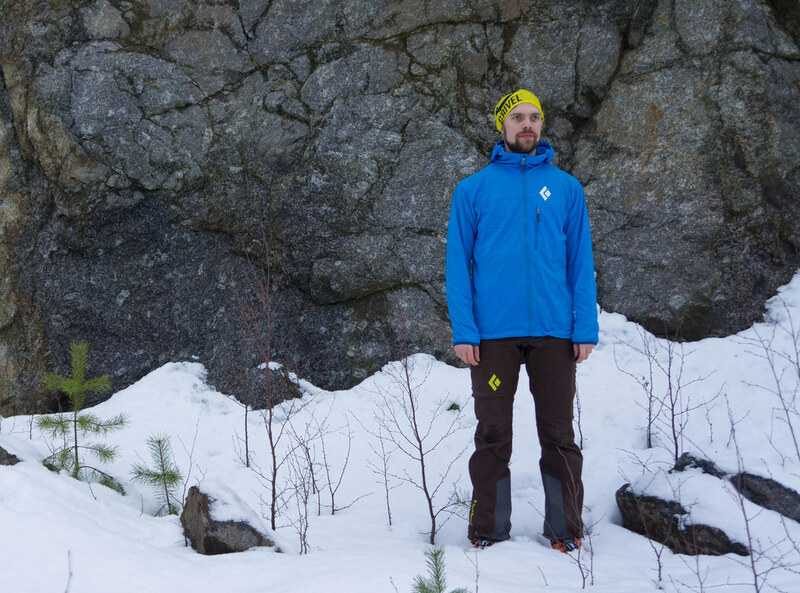 The Black Diamond Alpine Start Hoody is a very interesting jacket: Made from Schoeller softshell material with a NanoSphere finish, it is light, breathable, windproof and water-resistant. 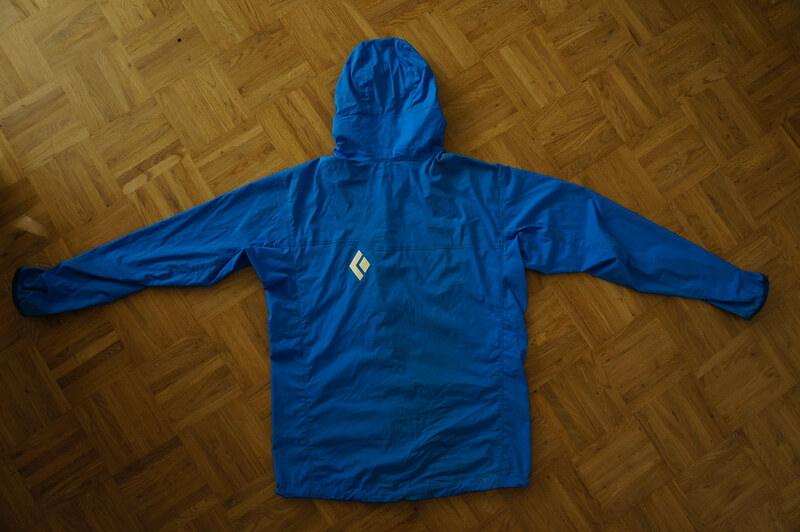 Could this be the wind jacket to rule them all? 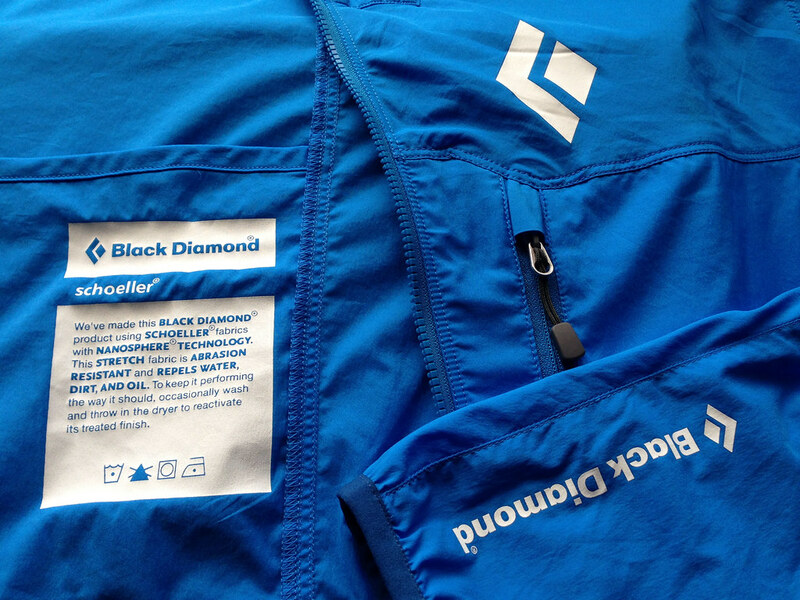 I’ve had the Black Diamond Alpine Start Hoody since November 2013 in constant use. It has been ice climbing in Korouoma, backpacking in the Lake District as well as cycling, walking and bouldering in Vaasa. It has seen well over 90 days of use in all kind of activities, and likely will see many more days in the future. It’s a softshell jacket. It’s a windjacket. It’s the one jacket you take if you need something that is light, windproof and breathable. Black Diamond has the Alpine Start Hoody on their Jackets and Shells page and says it’s “Built for days that start long before the sun comes up, the Black Diamond Alpine Start Hoody is an ultralight, softshell windshirt that offers minimalist-minded protection against stiff ridgeline breezes and light, unexpected precip.” I can sign that. The innovation in this garment is the use of the Schoeller® stretch-woven fabric that has a NanoSphere® Technology coating. It’s a 80 g/m2 fabric made from 93% nylon and 7% elastane and is very stretchy. The special Schoeller NanoSphere® is a “nanotech-based finishing technology that allows dirt and water to simply run off the surface of the textiles”. It “is transferred to the surface of textiles by means of nano technology” and which improves their water, dirt and oil repelling properties and makes it easier to clean in the washing machine. Additionally NanoSphere® is free from PFOA and PFOS and bluesign® approved. It certainly is a superb fabric with an equally impressive finish that we will see a lot more in the future. After six months of use, rubbing it against rock and ice, hanging ice tools over my shoulders on it and carrying backpacks the garment looks still like new. Sure, it could need a wash, but it pretty much still has the same bright blue colour it had when it arrived, and dirt has a hard time sticking to it. I will thank the NanoSphere® coating for that =) All seams hold up just fine and the zippers also work flawless. And in case something goes broken, Black Diamond has a Full Commitment Guarantee which will repair, replace or refund you if you’re not satisfied with it. 204 g in Size M. Heavier than much of the competition if looking at windshirt, but the lightest softshell I own. I’ve met with Schoeller at the ISPO and know that they’re a environmentally conscious company. Sadly I didn’t find any information on their sustainability and recycling efforts for the softshells; although you likely could get an old jacket repaired via the Black Diamond Full Commitment Guarantee. There’s one problem I have with this jacket: It’s not my size. I’m a Size S and this is a Size Medium, which makes it just a tad too long in the torso for my taste. Sure, I still use it almost every day and it’s currently my go-to windjacket, but I think I’d like it even more if it’d be my size. This short video I did on sizing illustrates the fit on me well (and garment sizing in general) and why I think it’s better to get garments in the size you need them. Now apart from that I really have no major complaints about the jacket. Well, maybe the brim of the hood could be better, but that really is already it. It’s a helmet compatible hood, and while it does fit over a helmet I have always worn it underneath it - in that case I can also wear a tubeshawl or beanie under the hood and still fit the helmet comfortably over it. You can adjust the hood via a drawstring with cinches on the right & left. These are inside, which I didn’t find to troublesome: Usually I adjust the hood once and that’s it. When I don’t need it it hangs down in the back, while when needed I can easily pull it over my head even with the front zipper fully closed. It’s a good, close fit and certainly offers a bit more protection than for example on the Rab Cirrus windjacket. The hood turns well with your head when cinched down, both to the sides and up & down. The Alpine Start Hoody has a straight hem with one drawcord cinch which you can operate via the inside pocket. The inside pocket is big enough to hold a Nalgene water bottle or your map and compass. A folded map and compass also fit into the chest pocket, as does the jacket itself. 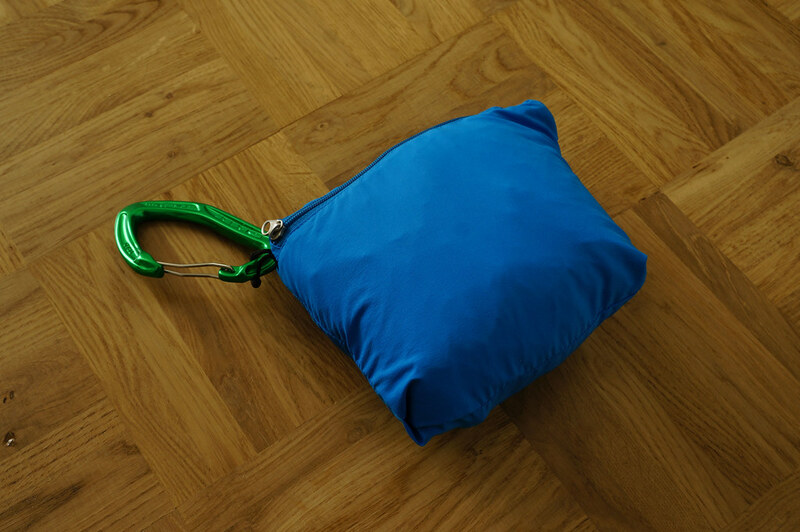 Packing the jacket into the pocket is straight forward and easy, and it makes for a soft, small package that you can either hang via the carabiner clip to your harness or can stuff into your backpack. The sleeves have elastic cuffs which are a bit wide, though if you wear gloves they make a tight fit over the gloves and will not let any cold air in (or hot air out). The wind protection of the jacket is very good, though in seriously strong wind at low temperatures I prefer a real hardshell as it is warmer. 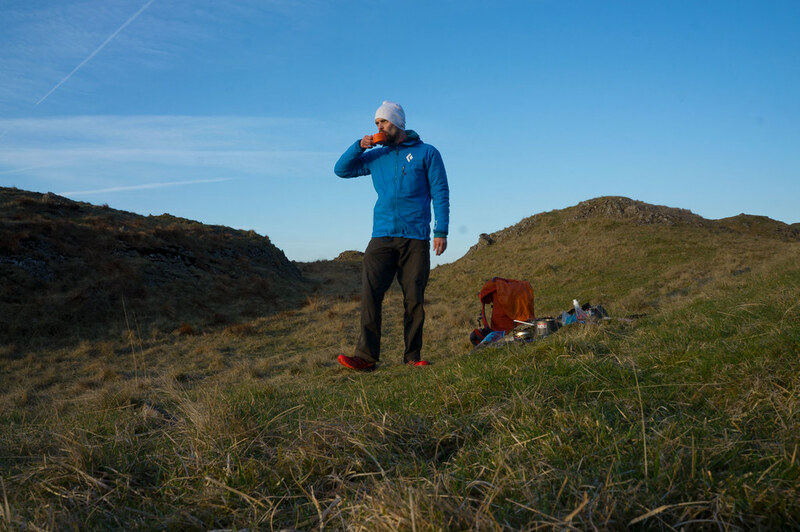 For activities in warm & windy weather - summer backpacking & hiking, alpine climbing, spring mountaineering adventures - the Alpine Start Hoody is a superb choice. It’s fairly water-resistant and as I was ice climbing in the jacket in January at -4°C on a very wet ice fall the jacket held me nicely dry. At some point the fabric got a bit saturated in one spot, but no water came inside. Even better, it dried very fast afterwards in the cold weather. As I was sent a Size Medium layering underneath is no problem. I can have up to three layers (Baselayer, Midlayer, Synthetic Puffy layer) on and still the jacket fits comfortable over it. I reckon if I’d have a Size Small I would need to leave the Syntethic Puffy layer away, but I could life with that. I find the breathability of the jacket very good. On cool & sunny days I didn’t overheat in the jacket, but those hot, sunny days in the Lake District when I was hiking up I needed to pull the sleeves up and open the zipper to not overheat. Where the backpack was I had perspiration accumulating and wetting the fabric, but a few minutes in the wind and sun and it was dry again. 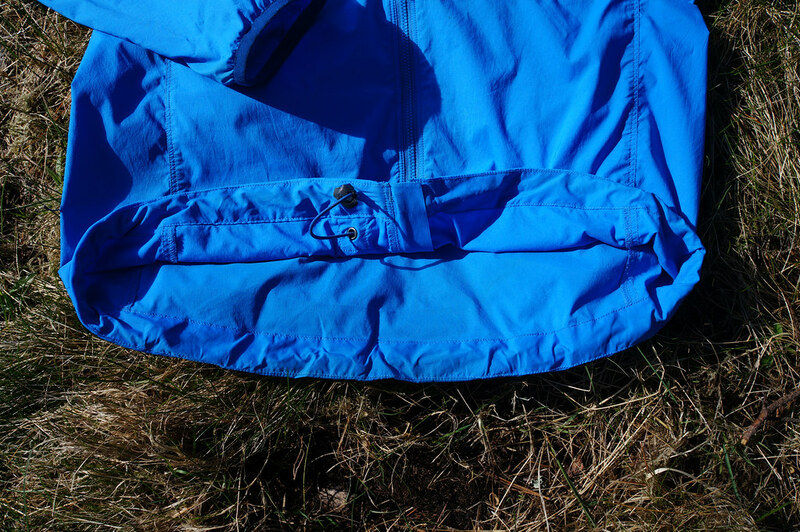 The breathability is better than other wind jackets I own, and really is much better as any hardshell material - as it should be, as this is a softshell fabric after all. The freedom of movement is superb as you’d expect from a garment that’s made for climbing. If you leave the hem loose and don’t cinch it tight (as I like to do) then you can comfortably move your hands far up without that the jacket moves. If you’re gone stretch then the hem will move, and even more so when cinched tight to not let any drafts in. It’s nice to wear the Alpine Start Hoody just over a T-shirt as the inside is soft and comfy on the skin. All seams are flat so there’s no chaffing or pressure points under backpack straps or your climbing harness. Finally, the garment has a seriously high level of abrasion resistance. I have bouldered now a handfull of times in it, rubbing it across sharp edges, dragging it over the granite and also have ice climbed in it, and there’s not a single spot on the fabric which looks worn. Also carrying a backpack with it - be it backpacking, approaching or grocery shopping - has not produced any pilling or damage to the shoulder area. Absolutey fantastic. At the moment there’s no Schoeller NanoSphere® wind jacket I’m aware of, but of course there are several other wind jackets and light softshells on the market which compete with this garment. 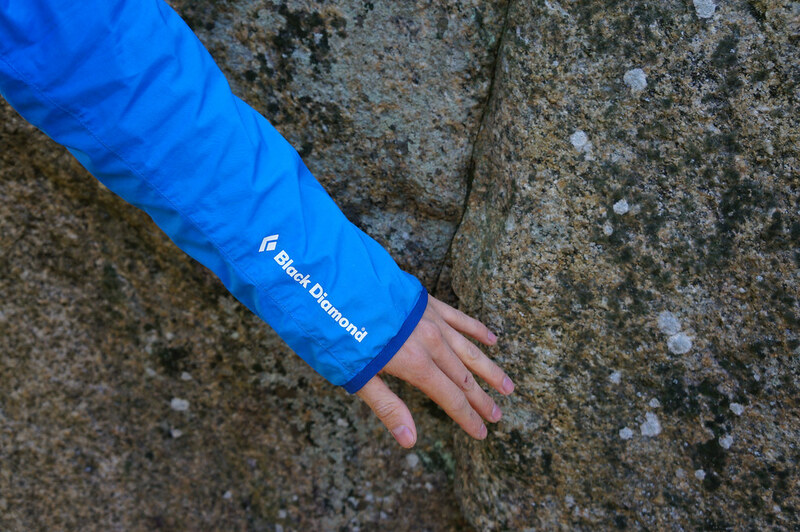 The Black Diamond Alpine Start Hoody is comfortable on the skin, very durable, lightweight, breathable and keeps the wind at bay. It’s also very water and dirt repellant and easy to clean with cold water. It has great freedom of movement and an acceptable hood. Even if my jacket is not my size, I am still using it daily for many activities - and that’s a very good indicator of how good this jacket is. 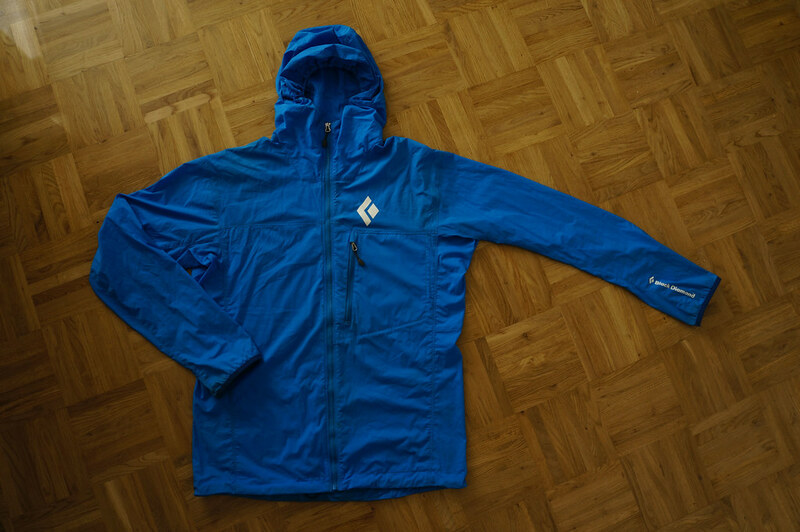 Looking at what it is made for, and what it does, I think this is fabric-wise one of the best wind jackets currently on the market. Get your Black Diamond Alpine Start Hoody at CampSaver.com, Bergzeit, Bergfreunde (currently on offer! ), Backcountry.com and REI.